Planning and financing is progressing for construction of a new interchange between E. Martin Luther King Drive and Interstate 71. 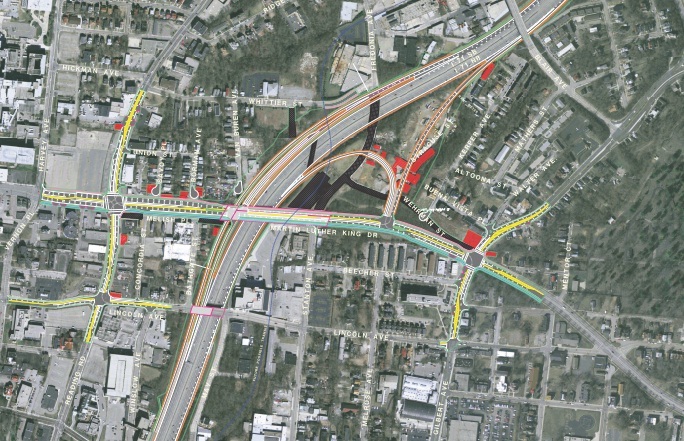 The $108 million MLK Interchange will fill the most obvious gap in the area’s expressway system – zero access to Uptown from northbound I-71 and circuitous access from southbound I-71 via the William Howard Taft ramp. The Taft and McMillan ramps will remain under the state’s current plans, but the new MLK Interchange will become the preferred point of access for the University of Cincinnati, Children’s Hospital, the Cincinnati Zoo, University of Cincinnati Medical Center and surrounding residential neighborhoods. Martin Luther King Drive as it passes over I-71 presently. Photograph by Jake Mecklenborg for UrbanCincy. In addition to the MLK Interchange, the Ohio Department of Transportation (ODOT) broke ground on the reconstruction of I-75’s Hopple Street Interchange. 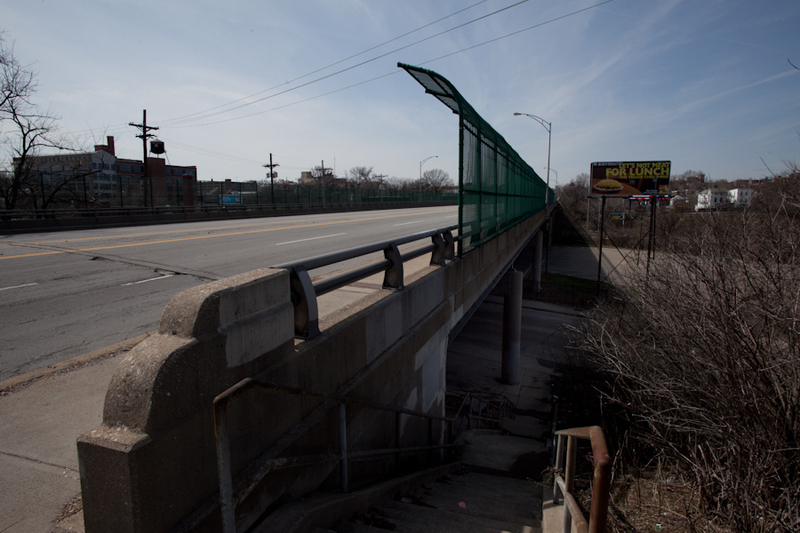 This project will reconfigure W. Martin Luther King Drive west of McMicken Street to meet Hopple Street on a new bridge above Central Parkway. Two years ago UrbanCincy reported on these two transformative projects, planned for each end of Martin Luther King Drive, which will dramatically change the way motorists access the region’s second largest employment center. The MLK Interchange has been the subject of considerable attention during the first half of 2013 due to the controversy generated by COAST when it worked to block Cincinnati’s Parking Modernization & Lease deal. The deal, which is now proceeding after a lengthy legal battle, was originally envisioned as the source for the $20 million local contribution to the interchange project. In addition to blocking the parking deal temporarily, the injunction prevented the City of Cincinnati from passing emergency ordinances. This detail jeopardized the streetcar project, as it was timed perfectly to coincide with council’s need to allocate additional funds after construction bids returned much higher than expected. Financing is beginning to fall into place to fund the preferred alternative for the $108M MLK Interchange. Provided. In April, an effort led by COAST and City Council member Chris Smitherman (I) gathered the necessary signatures to place the parking lease ordinance on the November 2013 ballot. However, on June 12, the parking lease injunction was overturned by Judge Penelope R. Cunningham, wife of anti-streetcar and anti-parking lease 700 WLW talk host Bill Cunningham. With the ballot issue avoided, streetcar and MLK Interchange planning resumed. On July 9, the Ohio Controlling Board approved $4.2 million for property acquisition near the planned MLK Interchange in anticipation of a July 2014 start date for the project. Then, on July 22, Ohio Governor John Kasich (R) announced that a portion of his $3 billion lease of the Ohio Turnpike will fund the state’s contribution for the project. The turnpike deal, which is similar in its strategy to Cincinnati’s parking lease, has hypocritically been spared the legal obstructionism of COAST or the criticism of talk radio hosts. City officials say that formal presentations will be given on the half-hour, and that those who are unable to attend can still submit their comments or questions until Friday, August 2, 2013. Those wishing to submit their comments outside of the meeting can either email info@uptownconsortium.org or send in written correspondence to the Uptown Consortium at 629 Oak Street, Suite 306, Cincinnati, OH 45206. Previous articleMiami developers are turning away from cars, can Cincinnati be next?